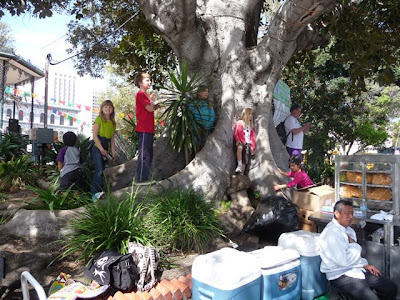 A few months back we joined a few other westside homeschool families for a walking tour of downtown Los Angeles. 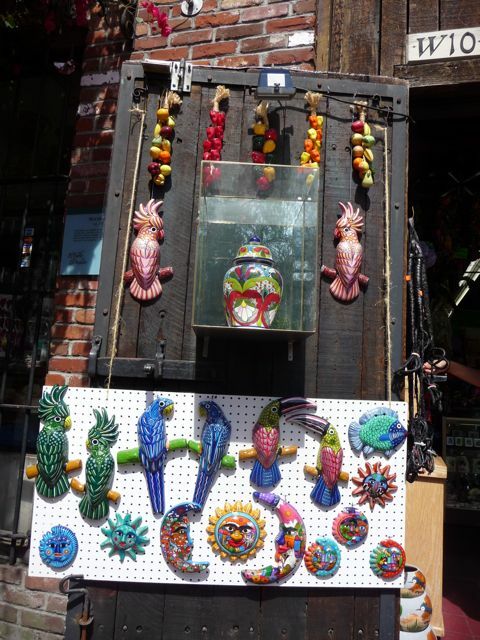 First stop: Olvera Street. 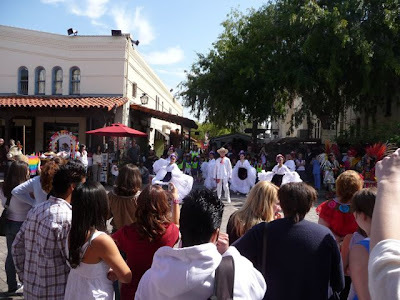 We were there on May 5th, Cinco de Mayo and were able to see a couple of Mexican dancing groups. The general name is "folklorico" - and I believe the above group would be considered "folklorico veracruz" - originating from the state of Vera Cruz, located on the Mexican Gulf Coast. My kids - along with the other homeschool kids - trying to get a better view. Also featured: an Aztec dance group. I'm always curious if these guys can actually trace any of their lineage to the Aztecs (apparently, yes). The Cinco de Mayo celebration was a few feet away from the Central Plaza - and bandstand, built in 1962. 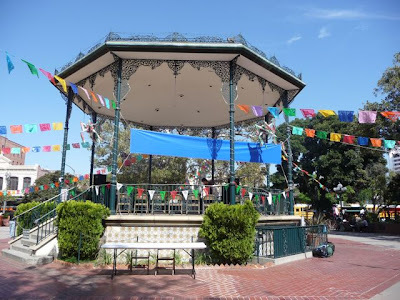 Growing up in Los Angeles, I have great memories of school field trips to Olvera Street and running around the bandstand with my friends. It has an amazing acoustical echo - but, unfortunately, it's now closed off when not in use. 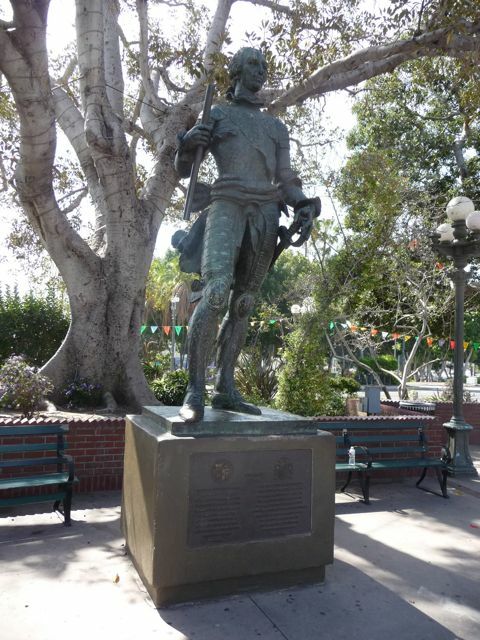 A statue of King Carlos III, the Spanish monarch responsible for the founding of Los Angeles in 1781. 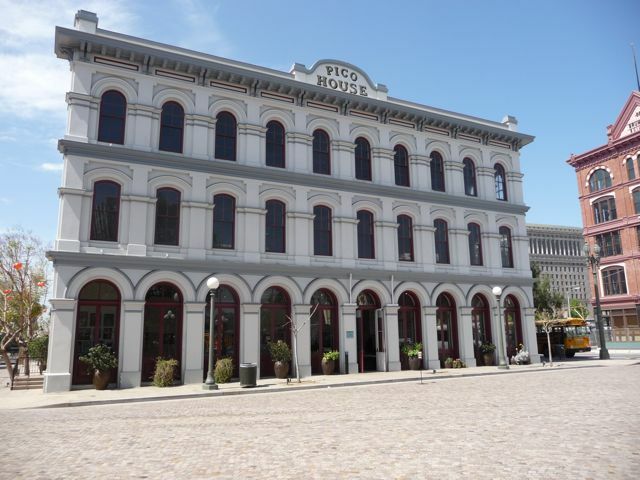 At the southern end of the Plaza is the old Pico House, Los Angeles' first major hotel. 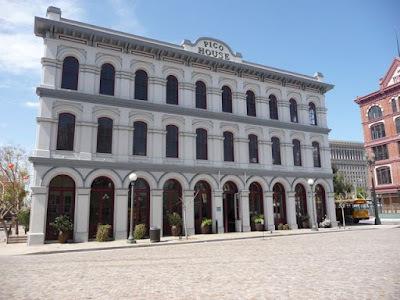 Built by Pio Pico, the last Mexican governor of California, it was the largest hotel in Southern California when it opened in 1870. The building has been restored, but unfortunately isn't used for much besides special events. Here's a link to a wikipedia article. 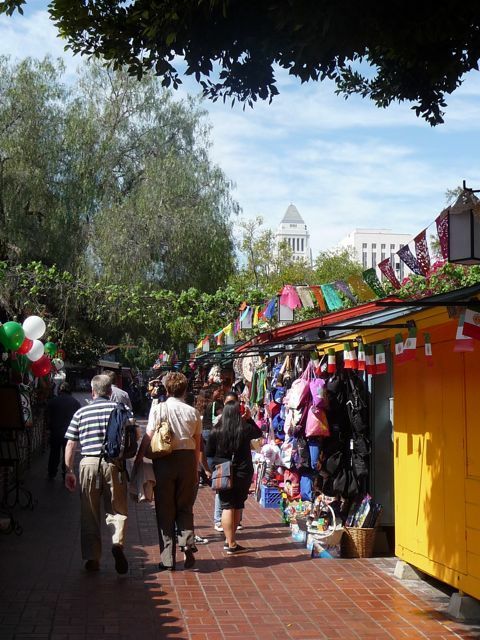 Entering from the north end of the Plaza is Olvera Street itself. 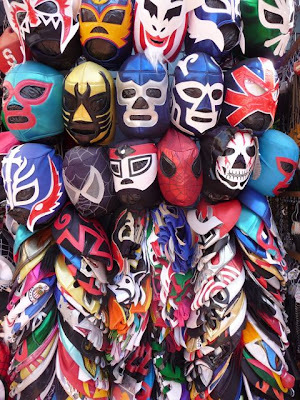 It's a quaint one block pedestrian street filled with shops, restaurants, and vendors' booths designed to look and feel like old Mexico. 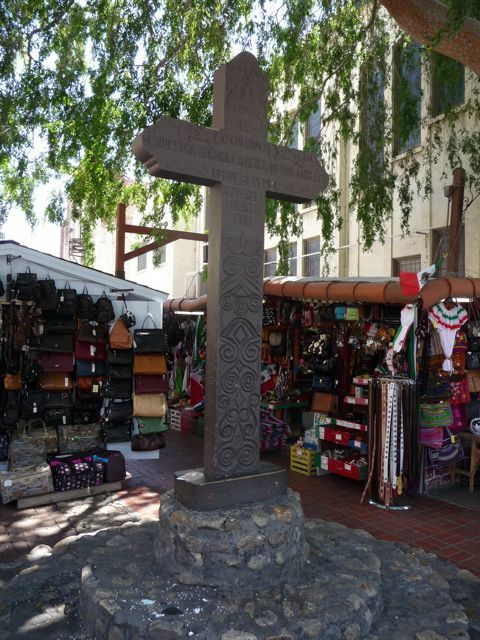 Olvera Street is located in between Main and Alameda Streets. Technically, it's an alley (more on that in a bit) so the shop entrances are the back sides to the original buildings. 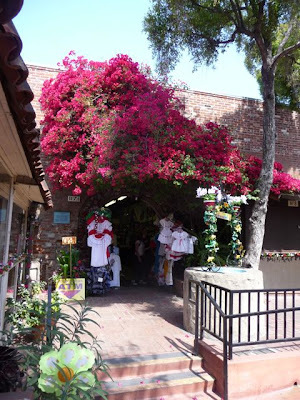 The heart of Olvera Street is the Avila House. Built in 1818, it's the oldest surviving building in Los Angeles. 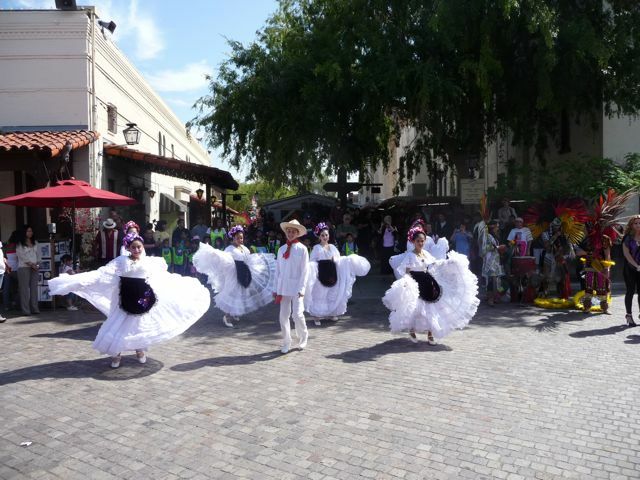 It, as well as the rest of Olvera Street and the Plaza, are now part of the California State Park system. 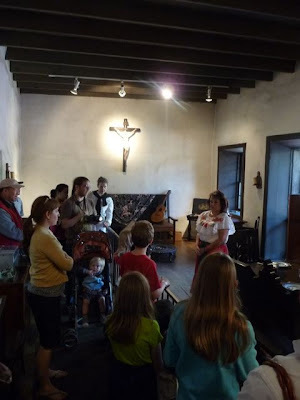 The Avila House has been restored to what it looked like in the early 1800's. Inside, docents provide some additional background information. Our homeschool group took a few minutes to stop and walk through. Here's an amazing old photo (click for a larger view) of Los Angeles. Taken in 1869, I'm assuming it was taken from the then-under-construction Pico House. To the right is part of the Plaza, to the left is the Plaza Church. 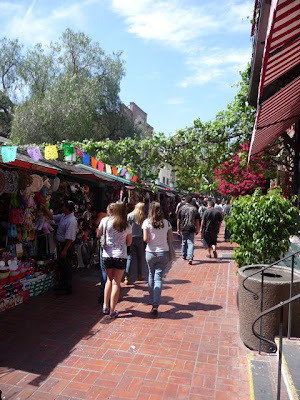 Olvera Street begins at the edge of the Plaza, my guess is on the right of the photo. Wow, pretty rustic. 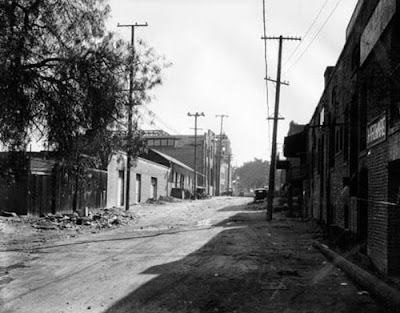 Hard to believe the changes L.A. would undergo over the next 100 years. 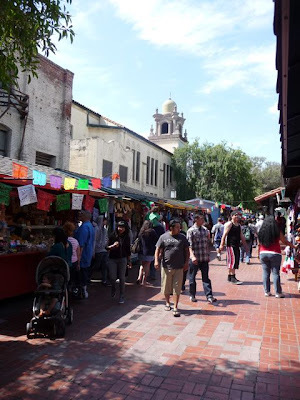 Back to Olvera Street: by the 1920's the commercial center of Los Angeles had moved southward and the street, now an alley, had become an urban slum. Enter Los Angeles socialite Christine Sterling. 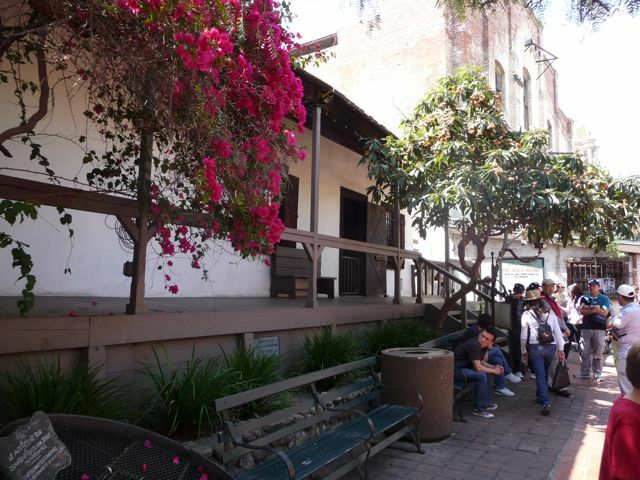 The Avila House, the oldest building in the city and located on Olvera Street, had been condemned and - this being Los Angeles - was slated for demolition. Sterling used her social contacts, including the leadership of the Los Angeles Times, to save the Avila House, and to radically change Olvera Street forever. The Olvera Street that millions of locals and tourists have enjoyed over the years was the vision of one woman. 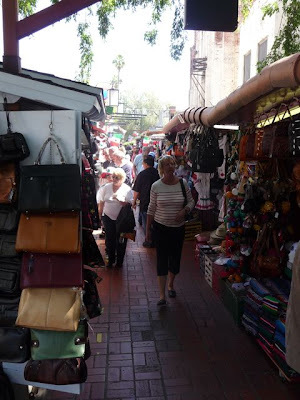 Working tirelessly, and with no money to speak of, she single handily turned Olvera Street into a pedestrian thoroughfare, complete with shops, restaurants, and market stalls. The Olvera Street that we know today opened on Easter Sunday, 1930. Pictured on the right is Christine Sterling. 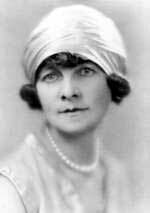 Amazingly, she actually made the Avila House her personal residence, living there until her death in 1963. 25 years before Walt Disney had his "Main Street USA" and decades before Universal built "City Walk" or Rick Caruso envisioned "The Grove" --- Christine Sterling turned a slum into a successful commercial, cultural, and historic center. 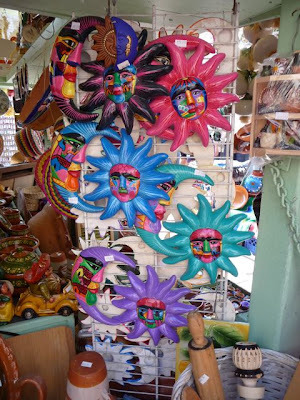 Whether you're looking for colorful Mexican artwork . . .
a guady Mexican wrestling mask . . .
or something in between, Olvera Street has it. After 80 years, there still a wonderful and sentimental charm to the place. Oh, and some great restaurants. Did I mention that? 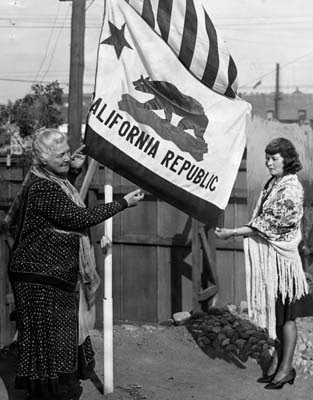 In many ways, it's not a historical representation of Mexican California as much as it is what people in the 1920's and '30's imagined Mexican California to be like. A final photo: how many other pedestrian shopping districts in Los Angeles are anchored by a cross? Here's a link to the Olvera Street website. And a link to the "Big Orange Landmarks" blog post on Olvera Street and the Plaza, with some great photos. How come you guys seem so different from the homeschool families I know? Most of them would stay clear of Los Angeles. 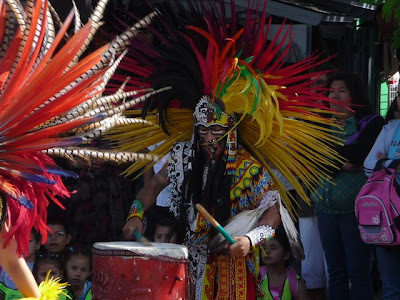 To answer your question about lineage yes we can and we find the term "costumes" highly offensive as we are not pretending to be something, we are honoring our ancestors and what has survived from the conquest. Erika, thanks for the clarification and feedback. I just made a slight edit to the post based on your comment.